At some point yesterday I lost the lens cap from the standard lens of my camera. 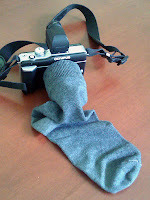 Being super fussy about the cleanliness of my equipment, I had to improvise protection with the use of a sock. While whipping the camera out on various occassions throughout the day, I realised the floppy appendage might have looked a bit odd. The sock made the filter on the front a bit fluffy, but it stopped it from getting scratched in my bag.